The Annual General Meeting of Sri Lanka Women Lawyers’ Association was held on 3rd December 2016 at the Kingsbury Hotel, Janadhipathi Mawatha, Colombo 01, presided over by Mrs. Berney Alwis, the President of the Association. A 09 day trip was organized by the Sri Lanka Women Lawyers’ Association to Vietnam from 10th December to 18th December 2016. 14 women lawyers’ with their families travelled on this trip. Rs: 2000/- was charged by the Association from each member for Visa processing and arranging the trip. Notice Board of Sri Lanka Women Lawyers’ Association has been arranged near the Ladies Room of District Court building in Hulftsdorp and it was ceremonially opened in December by Mrs. BerneyAlwis, the president of the Association. 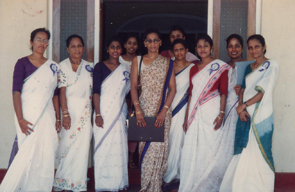 Ms. Chathurika Wijesinghe, Past President, Mrs. SandhyaThalduwa, Vice President, Ms. Swarna Jayaweera , Secretary, and Ms. PriyadharshiniGunasena, Treasurer, Mrs. KumuduAriyaratne, Asst. Treasurer and Mrs. Mihiri Fernando, Committee member also participated. 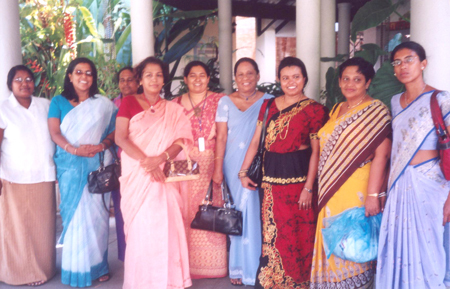 Sri Lanka Women Lawyers’ Association organized the local trip to Yala on 8th & 9th October and 53 participants joined in. A safari tour was arranged as well. All the participants enjoyed themselves throughout the journey in high spirits. Mrs. BerneyAlwis, president, Ms. Chathurika Wijesinghe, Past President and Ms. Priyadarshani Gunasena, Treasurer met with representatives of above firm on 5th October, 2016 and held discussion on how USAID could contribute towards better implementation of the Rule of Law. One of the focus areas of the meeting was enabling greater participation of Sri Lankan Women Lawyers in litigation and titles to land and land registration. Our Association together with the Gampaha Bar Association in collaboration with the Ragama St. Peter and Paul's Church, 15 schools in the Ja-ela electorate, the Lions Club, the Red Cross Society, the Traders’ Association, Buddhist Priests in the area and the members from the National Dangerous Drugs Control Board attended the “Walk to eradicate drug menace”. The walk started from the Ragama Church and continued to Basilica Vidyalaya and there was an awareness meeting held at the college grounds of the Basilica Vidyalaya. Sri Lanka Women Lawyers’ Association held the above Seminar on 14th May 2016 at H.W. Jayawardena QC Auditorium (BASL Auditorium), Hulftsdorp. Eminent speakers, Mr. Ali Sabri PC conducted the session of Professional Ethics, Mr. U.R. De Silva, Senior Counsel conducted the session on Court Craft and Social Etiquette was conducted by Mrs. Rosy Senanayake , Deputy Chief of Staff, Prime Minister’s office. The Association organized a donation of lunch packets and essential items to the victims affected by floods in Navagamuwa on 21st May 2016. The expenditure of this worthy cause were borne by Office Bearers, Committee Members, Past Presidents and their families personally. Sri Lanka Women Lawyers’ Association held the above Seminar on 29th July 2016 at Mahara Court premises. Eminent speakers, Mr. Ali Sabri PC conducted the session on Professional Ethics,Mr.U.R. De Silva, Senior Counsel conducted the session on Court Craft and thelecture on Primary Courts procedure under Sec: 66 was conducted by Mr. Weeraratne , Senior Lawyer of Mahara Bar. Sri Lanka Women Lawyers’ Association met the delegates of Myanmar Bar Association at Hilton Colombo Residencies on 22nd March 2016. At this meeting, members of both countries shared common interests of the legal profession, particularly with regard to women. 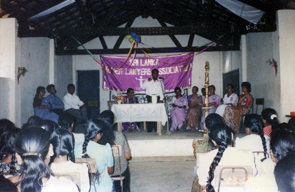 Sri Lanka Women Lawyers’ Association held an awareness programme for children & parents at Holy Family Church, Rajakadaluwa in collaboration with Father Sampath of Rajakadaluwa Holy Family Church with the assistance of Sister Superior Rev.Ethel Alwis of St. Joseph School for Deaf, Ragama on 27th February 2016. On 24th January 2016, a ceremony was held to lay the foundation stone to build a house for a needy lady lawyer to whom this land was donated by Dr. Guruge in collaboration with the Sri Lanka Women Lawyers’ Association on 11th November 2014. A 08 day trip was organized by the Sri lanka Women Lawyers’ Association to Myanmar from 22nd Dec to 30th Dec 2015. 08 women Lawyers with their families travelled on this trip. Rs: 2500/- was charged by the Association from each member for Visa processing and arranging the trip. The Annual General Meeting of the Association was held on 12th December 2015 at the Colombo National Museum Auditorium, Colombo 07,presided over by Mrs. BerneyAlwis, the President of the Association. 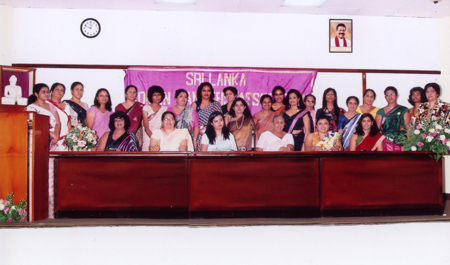 Sri Lanka Women Lawyers’ Association organized this event on 7th November 2015 in collaboration with the Welfare Society of Basilica Maha Vidyalaya and its Principal Father Shread. There were about 750 participants for the programme. Sri Lanka Women Lawyers’ Association joined hands with our Vice President, Ms. Sandhya Thalduwa and her family on the occasion of “Danaya” to “Somawathiya Chaithiya” on 20th September 2015 for a project towards the needy expecting mothers in the area of ‘Somawathiya Chaithiya”. Sri Lanka Women Lawyers’ Association organized the most extravagant event “Purple Night” (Dinner Dance )on 20th June, 2015 at the BMICH as a fund raiser of the Associationin aid of welfare activities of Women & Children. There were about 250 attendeesand it was a successful event. Sri Lanka Women Lawyers’ Association felicitated Her Ladyship Hon.Justice KumudiniWickramasinghe on her appointment as a Judge of the Court of Appeal at her chambers on 18th March 2015. 52nd Annual General Meeting was held on the 6th December, 2014 at Skill Centre, Royal College, Colombo 07. Head of the Dept: of Public & International Law, University of Colombo, Mrs. Jeewa Niriella was the Chief Guest for this occasion. 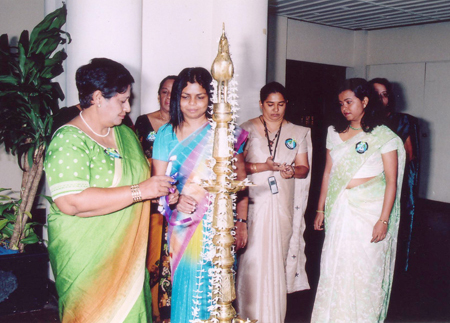 In the year 2014 on an invitation from the President, International Federation of Women Lawyers, the Head, Department of Public and International Law, Faculty of Law, University of Colombo, Mrs. Jeeva S. Niriella, the Country Vice President FIDA for Sri Lanka, Mrs. Ridmika Dep, Secretary, Sri Lanka Women Lawyers' Association, Mrs. Pramuditha Senaratne and the Treasurer, Mrs. Swarna Jayaweera participated in the said Conference held in November 2014 in Bangalore on the theme "FIDA 70 YEARS OF ADVOCACY, CHANGING LIVES,CHANGING SOCIETIES, CHANGING STATUS OF WOMEN". We received the happy news from the Kandy Bar that our member, Mrs. Thanuja Ekanayake had given birth to quintuplets. We are glad to have helped her by assisting her with formalities at the time she received a donation from the President's Fund. On 24th November 2014, the First Lady, Mrs. Shiranthi Wickramasinghe Rajapakse handed over the cheque at the President’s House. We thank Mrs. Pushpa Rajapakse and Mrs. Chathurika Wijesinghe for the cash donation of Rs.60,000/= handed over on the same day and we specially thank Mrs. Mallika Hemachandra for the gift of five numbers of Gold "Dharmachakra" gifted to the babies. Welgama village is situated close to the famous Hot Springs at Kanniya in Trincomalee District, bordering the Northern part of Sri Lanka. The village has faced many problems and difficulties during the time of LTTE troubles. A lot of people in the village were brutally assassinated by the LTTE during the said period. Thiriyaya Raja Maha Viharaya is a well known historical place where the Lord Buddha's live Hair Relics are placed ("Girihandu Seya"). This place was also severely damaged by the LTTE during the war. When women Lawyers went on their local trip to Trincomalee in 2013, we visited this historical Thiriyaya Raja Maha Viharaya. After offering flowers and other poojas to Girihandu Seya , our Vice President, Mrs. Sandhya Thalduwa with the consent of the President, Mrs. Yamuna Gunasekara decided to do the Katina Pinkama in 2014 at Thiriyaya Raja Maha Viharaya and informed the Chief Incumbent of the Temple. The above program was organized by the Sri Lanka Women Lawyers' Association in collaboration with the Lions Club of Matugama 306 A2. This occasion was graced by the Hon. Deputy District Governor, Lion Dr. D. D. N. Kaluarachchi as the Chief Guest and Lion Lady Dr. Mrs. Manel Kaluarachchi. A Raffel Draw was organized to raise funds for the Mathugama Schools' Project. We collected Rs. 100,000/= by selling 1000 tickets priced at Rs. 100/-. We are thankful to Mrs. Indira Samarasinghe PC who graced the occasion for the Raffel Draw on 25th July 2014 at the SLWLA premises. We are very grateful to our members who donated gifts and helped to sell tickets and specially the first prize winner who was a well-wisher from Mobitel who informed us not to purchase the Microwave Oven since the Association was raising funds for a worthy cause. This event was very significant as Past President Mrs. Chathurika Wijesinghe coordinated with Attorney at Law Mrs. Pushpa Rajapaksha and arranged a land to be donated to a needy lady lawyer. Dr. Guruge donated a land from the Royal City in Negombo. On 11th November 2014 the Deed of Gift was executed by Dr. Guruge in the presence of Hon Minister, Basil Rajapaksha at his office. Mrs. Chathurika Wijesinghe and Mrs. Yamuna Gunasekara signed as witnesses. The generous Dr. Guruge agreed to bear the stamp duty. The Annual one day trip was organized to a Boutique Hotel – ‘Munasinghe Mahagedera’ at Matugama. Everyone enjoyed themselves singing and dancing in high spirits with the Calypso Band. An attractive Fancy Dress Parade was organized and it was a very enjoyable and exciting event. 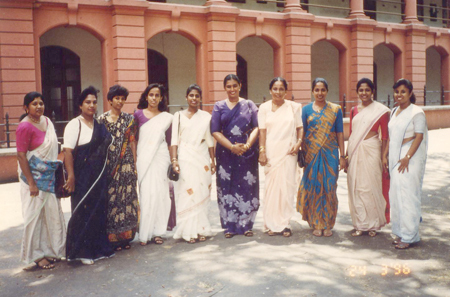 I believe the memories of the three Charlie’s Angels, Mrs. Swarna Jayaweera, Mrs. Priyadarshini Gunasena and Ms. Ruchira Gunasekara will never be erased from the memories of the participants. We thank Mrs. Pramuditha Senaratne for organizing this event. 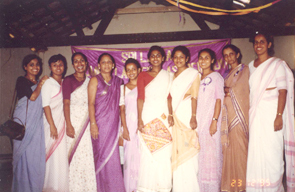 This Shramadana Program was organized by the Sri Lanka Women Lawyers' Association at Bufard Samaranayaka & Wilfred Perera Elders Home, Korathota, Athurugiriya. We are very grateful to our Co-Vice President, Mrs. Sandhya Thalduwa, for organizing this event. Though it was organized to mark the International Women's Day, it was not limited only to women, as elderly men too were brought in from the streets, mostly sick and destitute males with nowhere to go. Some have wandered away from relatives who had neglected to look after them. Some had been left on the road by their own children. This home supports around 30-35 inmates with that sort of history. The Christmas Fair was held on 19th December 2013 at the Traffic Court Premises at Hulftsdorph. This was a fund raising event and we had several trade stalls. We thank the committee members who helped in numerous ways. Two Steel Office Tablesand a Plastic Cupboard were purchased to the SLWLA office. The Walls of the office were colour washed. The Doors, Windows and the Floor were painted in order to bring a new look to the office. The Photographs hanging on the wall were all framed afresh in order to bring in the new look. The expenses for the colour washing, painting and framing were borneby the President Mrs. Yamuna Gunasekara. 51st Annual General Meeting was held on the 7th December, 2013 at Colombo National Museum Auditorium, Colombo 07. Chairperson of the National Dangerous Drugs Control Board, Mrs. Leisha De Silva Chandrasena was the Chief Guest for this occasion. Felicitation Dinner for his Lordship the Chief Justice Hon. 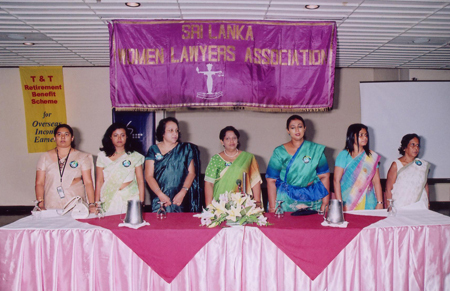 Mohan Pieriswas organized by The Sri Lanka Women Lawyers’ Association in collaboration with the Bar Association of Kalutara at the Tangerine Beach Hotel Kalutara on the 06th November 2013. On an invitation from the Country Vice President of FIDA (Federation International for Women Lawyers) – UK, Ms Jessie Nwabueze, the Country Vice President of FIDA Sri Lanka and the immediate past president of the Sri Lanka Women Lawyers’ Association Ms Ridmika Dep participated for the above convention held in London, United Kingdom, in September 2013. Along with Ms Dep, the office bearers of the Sri Lanka Women Lawyers’ Association Ms Sandhya Thalduwa (Co-Vice President), Ms Pramuditha Senaratne (Secretary), Ms Swarna Jayaweera (Treasurer), Ms Priyadarshani Gunasena (Assistant Treasurer), Ms Sudishna Perusinghe, and another two Sri Lankan Women Lawyers whom are presently live in UK, Ms Nisanka Karunathilake and Ms Anita Amendra were also participated and represented Sri Lanka. Sri Lanka Women Lawyers Association under the guidance of one of our Past presidents Mrs. Chathurika Wijesinghe with Daya Siriwardhana Cardiology Trust Fund renovated two Wards of Cardiology unit of the General Hospital Colombo in order to provide a better service to the sick who are suffering from Heart Problems. TheMale and the Female Wards were upgraded by renovating beds, bedside cupboards,bathrooms, pantry etc and by supplying ceiling fans, bed linen, door and window curtains and providing all other facilities. New Year Fair which is also an annual fund raising event in our calendar was held on the 27th March April 2013 at the Traffic Court Premises at Hulftsdorph where we had several trade stalls and entertainment. This Four day trip was combined with the Legal Awareness Program at Wakarei. All important areas which were affected by the Civil war and other places of interest areas in Trincomalee and Batticaloa were covered during this fantastic tour.The sites visited include Hot wells in Kanniya, Koneshvaram temple, Seruwavila Raja Maha Viharaya in Trincomalee, Girihandu Seya in Thiriyaya, “Koti Handa” Radio Station (A Buddhist Temple has been established in this place at present), ”Maawil Aru” Annicut which laid the foundation stone to bring Peace to our motherland, Swarnam Base, Lanka Patuna, Aranthala Bikshu assasination place, Mahiyangana Vanniyala Eththos’ Village, Mahiyangana Raja Maha Viharayaand several other places. Legal Awareness Program/Workshop Held In Wakare In Batticaloa District, Eastern Province. 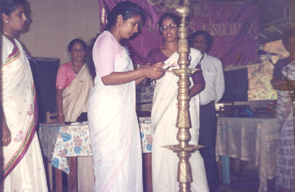 The above Program was organized by the Sri Lanka Women Lawyer's Association collaboration withthe Officer-in-Charge and the other officers of the Police Station, Wakare. This occasion was graced by the Hon. District Judge of Valachchanai Mr. Mohamed Riyalas the Chief Guest. The aim of this event was to educate the young children specificallythe girls under the age of 16 yearsand to enlighten them on thelaws relating to the marriages, mainly on child marriages which iscommonly seen in the Eastern Province. The illegalitiesof such marriages, the punishments which carry with such marriages were discussed in great detail. This Awareness Program was organized by the Sri Lanka Women Lawyers' Association collaboration with Colombo District Kantha Bala Mandalaya. This occasion was graced by the Hon.Magistrate and District Judge of Kaduwela Ms. Lanka Jayaratne as the Chief Guest and a speech was delivered addressing the Domestic Violence Act.President of the Bar Association of Kaduwela Mr. Kamal Wijesiri was the Guest of Honour.Chairperson Ranawiru Seva Adikariya Mrs.Wettewa, Government Agent Colombo Mr.Kamal Padmasiri,Divisional Secretary Kaduwela Mrs. U.S.P. Sooriyarachchi and the President Colombo Law Society Mr. Binara Gunasekara participated this occasion and delivered speeches relating to Land matters, Law relating to Divorce etc. The event was attended by about five hundred women from Malabe, Kaduwela, Athurgiriya areas. The highlight of the event was the Fashion Parade organized by the ladies of the said Kantha Bala Mandala along with Several Dramas, Dances and introduced handwork activities to the participants. All of those activities were organized by the Colombo District Kantha Bala Mandalaya. The event was brought to a close by distributing Nutrition food for the poorest women and Gift packs for pregnant mothers in the area. We thank our Co-Vice President Mrs. Sandhya Thalduwa for all the support rendered to our Association taking leading role in organizing this Awareness Program. The members of the SLWLA organized a Dhamma Deshana on the27th February 2013 at the High Court Premises Hulftsdorp to commemorate and to invoke supreme Presidents bliss of Nirvana to our Past President late Mrs. Seetha Wijewardhana and all of our late Past Presidents and late members of this Association. Venerable Dr.Induragare Dhammarathana Thero delivered a very valuable Dharma Deshana. We thank the Judges of the High Court Colombo, Staff of the High Courts,members of the SLWLA who attended this Dharma Deshana. 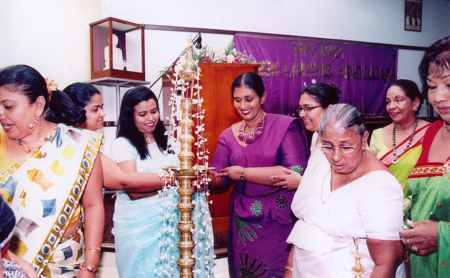 The Christmas Fair which has become an annual event of the Calendar of Sri Lanka Women Lawyers' Association was successfully held on the 11th December 2012 at the Traffic Court Premises at Hulftsdorph. We are grateful for the members who supported us immensely making the even a success by bringing in stalls and obtaining sponsor ships for this event. 50th Annual General Meeting (Golden Jubilee) was held on 25th Nov: 2012 at Cinnamon Grand Hotel.The first lady Mrs. Shiranthi Wickramasinghe Rajapaksha was the chief Guest for this occasion. The first lady launched the official Website of the Association at the occasion. An Award ceremony to felicitate the Past Presidents of the Association was also held in appreciation of their contribution to the Association during their tenure of office. In the year 2012, on an invitation from FIDA (the International Women Lawyers' Association), 8 members participated for the Conference in Cebu City, Philippine. Participating for this event, the Sri Lankan women Lawyers' Association has joined hands with FIDA and obtained an international recognition. Twenty members of the SLWLA, participated for the work under the banner of the Association, on 30th September 2012, in lieu of World Heart Day 2012 programme, on an invitation by Dr Vajira Senanayake, the President of the Sri Lanka Heart Association. This programme was organized to emphasis the prevention of Heart diseases. Most of the preventive measures are involved with changing lifestyles and is on the whole cost free. A balance and healthy diet to prevent obesity and diabetes, promotion of exercise, controlling diabetes and high blood pressure and abstaining from smoking are some of the important factors which should be encouraged in the society. Seminar on "Finance Business Act"
The members of the Association participated for a seminar on "Finance Business Act" on 13th July 2012 at Cinnamon Grand Hotel, Colombo, which was organized by ANC in collaboration with the University of West London. Participation for the peaceful march against the UNHRC resolution. The members of the Association participated for a peaceful march on 21st March 2012, to the Embassy of The United State of America, against the resolution that had been forwarded against Sri Lanka to the UNHRC sessions which was held in Geneva. Sri Lanka Women Lawyers' Association, with collaboration with Women In Need (WIN Jaffna) organized a legal awareness programme which was held on 18th December 2011, from 9.30 am to 2.30 pm, at T C T Hall, Navalar Road, Jaffna. The aim of this event was to address the legal issues particularly associated with Women in Jaffna and give them solutions for their day to day life. There were about 250 women were participated for this event. The 49th Annual General Meeting of the Sri Lanka Women Lawyers' Association was held on 30th October 2011, at Colombo National Museum Auditorium, Sir Marcus Fernando Mawatha, Colombo 7. Honourable Attorney General Ms. Eva Wanasundara (PC), was the Chief Guest for the occasion. The President and the Executive Committee of the Association (2010/2011) felicitated Honourable Ms. Wanasundara (PC) as the first Women Attorney General in Sri Lanka. Not only at the time of joy SLWLA have joined hands but also at the time of sorrow, pain and need of our members. The members of the SLWLA invoke blessings of dhamma through a "Bodhi Pooja" at Gangarama Temple during the time of sickness of one of our past presidents Ms. Sita Wijewardena, for speedy and complete recovery. Speech made by Ms. Ridmika Dep, the President Sri Lanka Women Lawyers' Association (2010/2012) at the welcome Dinner which was held on 02/07/2012 at Cinnamon Grand Hotel, Colombo. The Event was organized by the Bar Association of Sri Lanka. "Your Ladyship, Hon. Chief Justice Dr Shirani Bandaranayake, You are Lordships and Ladyships of the of Supreme Court and Court Of Appeal, Hon. Judges, Hon Acting Attorney General Ms. Eva Wanasundara President's Counsel, President of the Bar Association Mr. Shibly Aziz President's Counsel, President's Counsels, Senior Counsels and My Dear Colleagues..."
Inauguration of the prison project for the women prisoners in Welikada Prison organized by Ms. Sandya Thalduwa, secretary (2010/2012). This project was launched in the Welikada remand prison (female unit) on 03.03.2011 The Hon. High Court Judge Kumudunie Wickramasingha participated as the chief guest of the said event and Rev.Watinapaha Somananda Thero of Borella Vajirasramaya and Rev Father Sarah Hettiarachchi were also participated for the occasion. 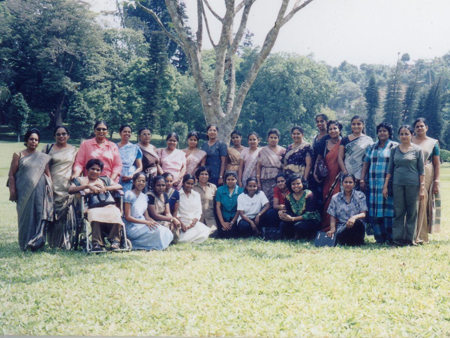 Several programs have been conducted by the Women Lawyers' Association of Sri Lanka to help over the elderly, long suffering women at ward No.3 of the National Hospital Colombo to mark the International Women’s Day which fell on 08th March 2011. 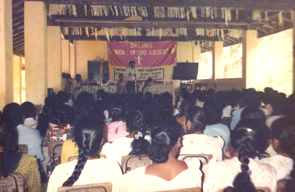 We conducted a legal awareness program/work shop which was organized by the National Youth Centre especially for the rural areas, at Lunugamwehera, in the Hambanthota District on 9th March 2011 in lieu of the International Women's day and represented women's rights in the society. Five of our members (President, Past President, Assistant treasurer and two committee members) were participated for the aforesaid event and have visited 17 centers in the Hambanthotata District, and discussed various legal issues which are facing by the people in those areas. Naththal Pola and Aurudu Pola which have become an annual events of the calendar was successfully held in December and April in each and every year at the premises of Traffic Court building at Hulftsdorp, Colombo 12. 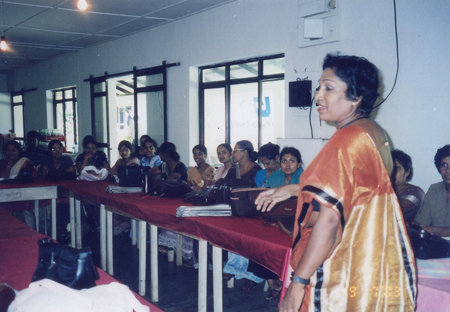 These events are been organized by the vice president Ms. Yamuna Gunasekara and Asst. Treasure Ms. Jayanka Kahawevithana. 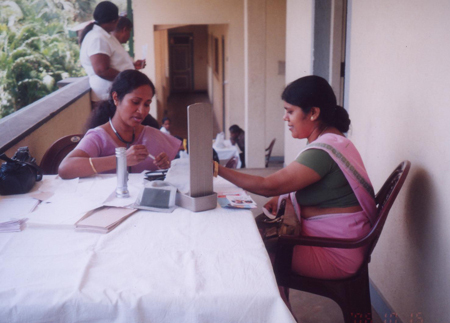 Medical Awareness and Human Rights Awareness programme, which was held at Anuradhapura in the year 2006. 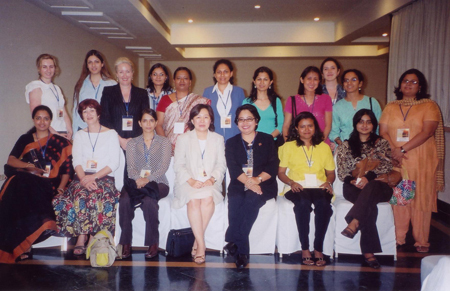 Ms. Ridmika Dep, treasurer (then) of the Sri Lanka Women Lawyers' Association, participated for the women Lawyers Forum(Seated at 6th place) of the Law Asia Conference, with Ms. Malathi Das, President Law Asia Conference ( Seated at 5th Place), which was held at Goa, India in 2006. One of the most attractive and enjoyable activities of the SLWLA is organizing the annual Local Trip and the Foreign Trip. This enhances the networking abilities among members, their families and their friends. Taking a vacation may not only make you happy, but increase your job performance. Rest, relaxation, and stress reduction are very important for people's well-being and health. This can be accomplished through daily activities, such as exercise and meditation, but vacation is an important part of this as well and it decreased risk of heart disease and improved reaction times as some of the benefits from taking some time off. Our mind is very powerful and can help with healing, so a rested, relaxed mind is able to help the body heal better.